New concrete structures require concrete formwork (louvers) such as walls, slabs, beams, columns, footings, etc. The template requirements for different structural members are different and they are named according to the type of structural member. The formwork (template) is a temporary mold that provides support for the fresh concrete when placed in the structural member until the concrete solidifies. This helps the structural member to obtain sufficient strength to carry its own load and load from other components. There are many types of structural templates or templates depending on the material, the use of the material and the type of structural member. They can be named based on this. However, the core functionality of the template remains the same. The first step in any concrete construction begins with the foundation construction. The foundation can be used for columns or walls. Therefore, based on the type of structural member, the basic shape and size are designed. Therefore, the size and shape of the template depend on the type and size of the footing. The reinforced concrete column form is subjected to lateral pressure due to its small cross section, high height and relatively high concrete pouring rate. Therefore, it is necessary to provide a tight joint and a firm joint support for the formwork. 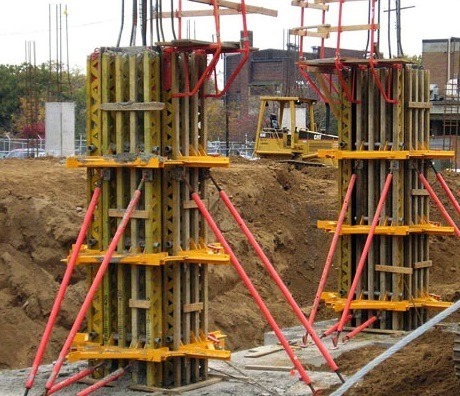 As the size of the concrete column increases, the stiffness of the formwork must be increased by increasing the thickness of the sheath, or vertical stiffeners must be added to prevent the sheath from deflecting. Formwork for wall construction are subjected to relatively lower lateral pressure than column forms due to their large cross-sectional area. Panel sheathing – It is used to shape the wall and retain the concrete until it sets. Studs – to support the sheathing or Wales by forming a framework to keep the forms aligned and support the studs. Braces – It is used to prevent deflection of forms under lateral pressure and keep the formwork erect. Ties and spreaders – These are used to hold the sides of the forms at the correct spacing. 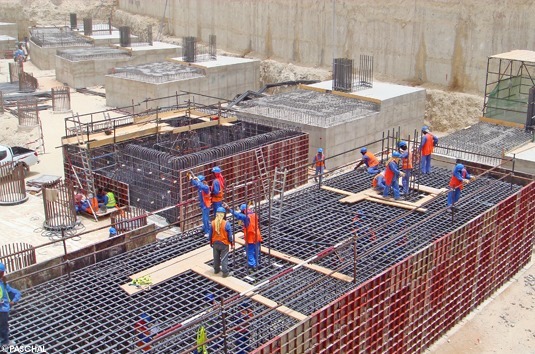 Formwork for reinforced concrete slabs depends on the type of slabs to be constructed. The floor slabs can be structural slabs supported on a steel or concrete structural frame, or slab-on-grade. The design of formwork varies with the type of slab. Positioning of the girder or beam form at the bottom. Girder side forms overlaps the bottom form and rests on the shore heads and the sides of the column form. 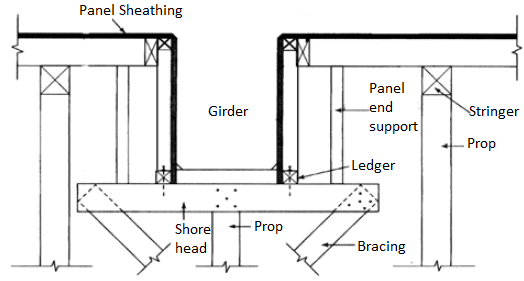 Side forms is held in place by ledger strips nailed to the shore heads with double-headed nails. Larger girders should have the side forms vertically stiffened to prevent buckling. When constructing the girder and beam forms each part must be removed without disturbing the remainder of the form; strike-off formwork will commence with the beam and girder sides, followed later by the column forms, and finally by the beam and gird bottoms. Slab-on-Grade Forms are forms for concrete slabs placed on grade. These slab formworks are usually quite simple as concrete is placed on compacted earth or gravel leveled base. Thus no support is required for concrete at the bottom. Sheets, plywood or steel sheets are used to form/support the open edges of the concrete. These forms are fixed by stud support. The reinforcement in the slab (if stated in the structural drawing) should be placed on the chair, the backing plate and the gasket made of metal or concrete according to the drawing. 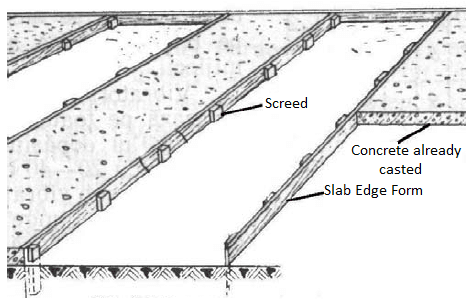 If the slab is to be cast in sections, a structural joint must be placed between them so that the cut can be transferred from one to the other. The details of the construction joint should be followed according to the structural drawing.